February 27, 2016 Robert W.
Las Vegas 89102 discount banners offer the opportunity to purchase discount banners to the public . These discount banners can be used in a variety of ways and for different organizations. Discount 89102 banners are available to businesses as well as organizations that want to promote their events. For example, as the weather starts to heat up, baseball season for thousands of kids through out the Las Vegas valley. Many of these baseball sports teams need banners for their teams and their sponsors so that they can display them during games. The baseball leagues themselves also have vinyl banners on display so that the children know which fields they are playing on. laso, many organizations because of the warming of the weather will need discount banners to promote their concerts, charitable walks and runs, barbecues and a host of other events they promote. Las Vegas 89102 discount banners are a big favorite of businesses in the Las Vegas area. Las Vegas businesses take advantage of the drive by traffic at their stores by placing banners so that they can be seen by the thousands of people that pass by their stores everyday. In addition, Las Vegas discount 89102 banners can be used to promote not only the store name, but also advertise store specials on products and services. Las Vegas 89102 discount banners are made with a tough, long lasting 3 ounce banner material with eco solvent ink ( ink that is designed for outdoor and indoor use that will not fade). The banners are then grommeted every few feet so that they are easy to install. The brass grommets allow for the banner to be attached to various surfaces very easily as well as with rope and hung between poles and trees. Las Vegas 89102 discount banners can be found at various sign shops in the Las Vegas area. February 26, 2016 Robert W.
Las Vegas poster board signs are being used at Las Vegas trade shows and conventions to present a professional presentation. These Las Vegas poster board signs are very portable and placed on easels and mounted on trade booth walls and are very professional looking. Poster board signs are not expensive and cost about $4.00 a square foot. These poster signs are mounted on either a 3/16 foam core board or a 1/2″ foam core board. ( The 1/2″ foam core board sells for about $6.00 a square foot) These Las Vegas poster board signs are generally laminated with a gloss finish that make for a shiny, professional appearance. These poster board signs are generally used for indoor usage and will deteriorate with outdoor use when exposed to weather. Poster board signs are also used in restaurants, especially fast food restaurants because they are so inexpensive. Many Hispanic taco restaurants will use poster board signs as a way to advertise their food products at the fast food counter. Since a poster board sign cost about $4.00 a sq. ft. a 2ft x 5ft menu board with a laminate on it would cost $40.00 and can be changed out very easily. Since the poster board is lightweight and can be hung with wire or mounted to a wall, the boards can easily be changed out and cost just a fraction of more expensive menu boards. Las Vegas poster board signs are also used for business presentations, school presentations and for convenience store advertising. Local convenience stores are using poster board signs at their check out counters to promote impulse purchase items. Las Vegas poster board signs can be purchased at local sign shops in the Las Vegas area. These poster boards can be ordered in advance and picked up for the trade shows and conventions as well so that they do not get damaged while being transported to Las Vegas. Clark County Nevada Banner Signs For Stores. February 24, 2016 Robert W.
Clark County Nevada banner signs are being used by stores all over the Clark County area in places like Las Vegas, North Las Vegas , Henderson, Mesquite, Paradise, and other areas. These Clark County Nevada banner signs are very popular because they are so inexpensive and bring results. Stores and businesses all over Clark County are taking advantage of the population growth that took place in the last 10 years. There are more vehicles on the road in Southern Nevada than ever before. Consequently, stores are relying upon drive by traffic and neighborhood customers to support their businesses more than ever before. Simple advertising at their locations with vinyl outdoor banners are helping drive business to their locations. As people drive by their location, they are able to see these strategically placed vinyl banners and take note of what services or specials the businesses are offering. One dry cleaner in Clark County is constantly changing out his banners weekly so that his specials on dry cleaning are always changing. One week it may be a man’s suit cleaning special, the following week it may be women’s dresses, then bed comforters and so on. The pointy being is that people in the neighborhood are always looking for a bargain and look forward to seeing his specials. Clark County Nevada banner signs are cheap and inexpensive. the average cost of a 13 ounce banner printed with inks designed for outdoor usage is about $2.00 a square foot. This includes grommets for easy installation. Large format printers can print these effective banners in a variety of sizes to accommodate the needs of the stores. Clark County Nevada banner signs can be purchased at any of the sign shops location in the area at very reasonable prices and many times they offer specials on the banners as well. Using a Las Vegas Banner Company For Advertising. February 19, 2016 Robert W.
Using a Las Vegas banner company is a good idea for a low budget marketing plan that gets results. A Las Vegas banner company can print you custom banners to advertise your business or event at a low cost and bring in more business. Vinyl banners are great for advertising. The local government transportation dept. does traffic studies in the Las Vegas area for various reasons. You can go down and ask the transportation office for the traffic study for the street your business is on. You would be amazed at the traffic count of vehicles on the roads of Las Vegas every day. Literally thousands of vehicles drive the major streets like Sahara Ave, Rainbow Blvd, Desert Inn. Warm Springs, etc. every day. By placing an advertising banner on your business premises, it would be seen by hundreds of thousands of people every year if your store is located on a major street. Smart businesses like automotive repair shops are taking advantage of banners by advertising their service specials on banners and then placing them at their locations to advertise to the vehicles and local residents who pass by their stores. During the summer months they advertise air conditioning repairs and at other times they will advertise check service light specials for when those pesky service lights on your vehicle light up on your car dash display. Advertising banners can be purchased at a Las Vegas banner company for a very affordable rate of a couple of dollars a square foot. 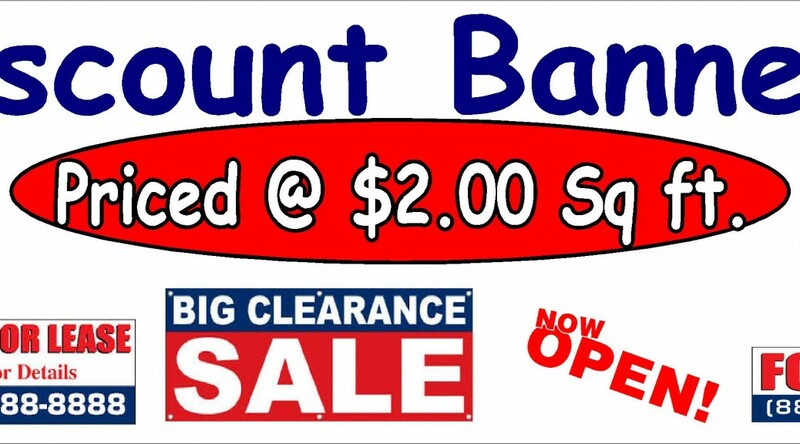 Many times, there will be banner specials like this one advertised on Backpage ( internet based classifieds) https://www.youtube.com/watch?v=iPARROEG90c. 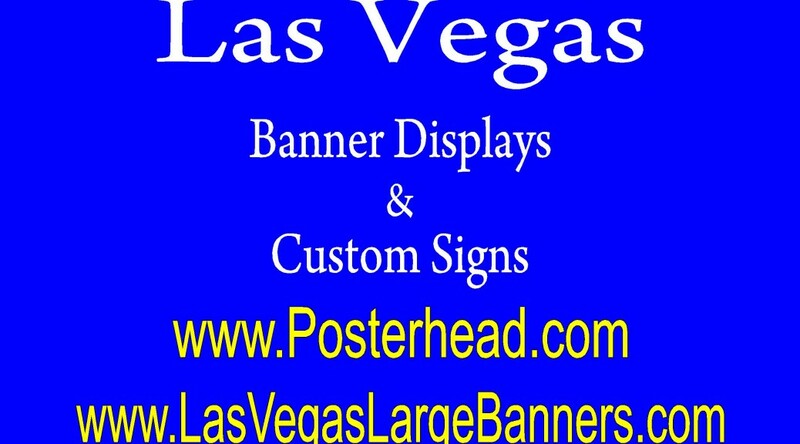 This particular You Tube video will show a short video of a Las Vegas banner company offering a full color 3ft x 8ft vinyl banner for the remarkable low price of $39.00. 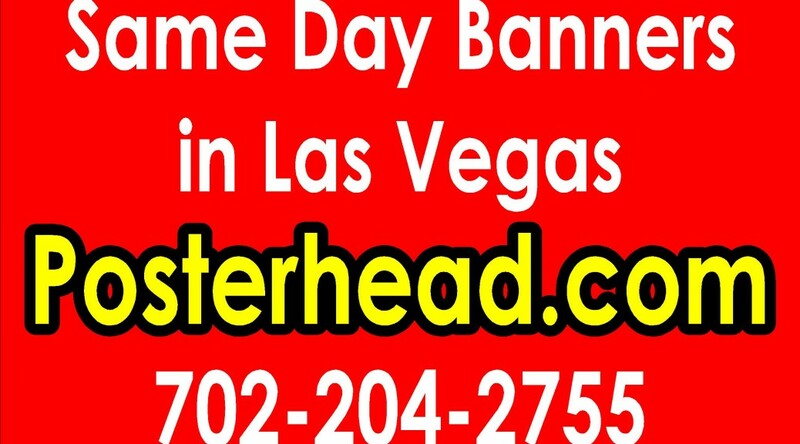 Contact your local Las Vegas banner company to help you with this low cost marketing tool. Clark County Foam Core Signs. February 18, 2016 Robert W.
Clark County foam core signs are very popular signs for presentations and trade shows / conventions. These professional looking signs are excellent visual displays to help reinforce your marketing message. Clark County foam core signs are made for interior use and not for outside usage. ( Coroplast substrate holds up much better for outdoor usage) The use of foam core boards outside will cause the foam core board to soften and bend. It must be kept dry or it will be damaged. Clark County hosts the largest gaming mecca in the world, Las Vegas. Las Vegas casinos use a lot of foam core signs as well for indoor signage since they are professional looking and are very low cost. The Las Vegas trade show industry is the largest in the world and many foam core signs are made for trade shows and conventions. Consequently, many sign shops in the Las Vegas area make these foam core signs in large quantities. and at very cost effective prices. Clark County foam core signs are usually made with a 3/16 foam core board or a 1/2 inch thick foam core board. The average price of a vinyl sign mounted on foam core board is about $4.00 a square foot ( a typical 2ft x 3ft foam core sign would cost about $24.00) Another popular size of foam core board is the 1/2″ thick board and that usually sells for around $6.00 a square foot. These foam core signs are full color, meaning you can have as many colors, pictures, logos mounted on them as you want. Many times, photos are mounted on foam core boards as well. These photo foam core boards are laminated with a gloss laminate to really bring out the quality of the photo and also protects the foam core photo board from scuffs. Get your Clark County foam core signs at your local sign shops or online. Southern Nevada Banners For Businesses and Events. Southern Nevada banners are being used at special events all over the area that are promoted by the different municipalities and businesses. These Southern Nevada banners are inexpensive and allow for easy promotion of events such as Breast Cancer awareness, Concerts in the Park, Muscular Dystrophy Walks, and many other charity events held by the cities and counties of Southern Nevada. In addition, these Southern Nevada banners are being used to promote special festival events like First Friday, Cultural Art performances and many other festivities that are organized by the different government agencies. Southern Nevada is a unique place to live and very diverse in its environment and culture. While everybody thinks of Southern Nevada as the gambling mecca of the world with its fine dining, five star accommodations, great entertainment, and 24 hour party scene that no other place in the United States offers, there are many interesting things to do in Las Vegas. Did you know that Las Vegas is the number one destination for trade shows and conventions ? Millions of people every year have a reason to come to Las Vegas and Southern Nevada. Southern Nevada businesses also use banners as a way to promote their businesses. Like every other city in the United States, Southern Nevada has had its share of downturn in the economy. While traditional advertising is ever changing, a simple vinyl banner hung at the business location with a snappy marketing message can drive customers to your location. Many people do not realize the amount of vehicular traffic that uses a major street in Las Vegas every single day. Thousands of vehicles use streets like Sahara Ave or Decatur Ave every day and people take notice of signs that are on display. Southern Nevada banners work for both businesses and events in keeping the population informed of what is going on in their community. February 16, 2016 Robert W.
Clark County outdoor banners are being used all over the county to promote stores and events. You cannot drive down one of the many streets of Clark County and not notice all the outdoor banners that are promoting one thing or another. These outdoor banners are very effective at promoting. Clark County outdoor banners are vinyl banners that are designed for outdoor use. These outdoor banners ( because of the weather conditions of Las Vegas and the surrounding area) need to be tough and have sun resistant inks used so that the text and colors on the banner do not fade in the extreme heat and sunlight of the summer months. Clark County itself uses these vinyl banners as a way to promote the many cultural events that the County puts on. In addition, the large cities of Henderson and Las Vegas also use these outdoor vinyl banners as a way to promote parades, concerts, and other government sponsored events. Businesses located in Clark County take advantage of the cheap advertising they offer. While traditional print ads, weekly mailers, television, radio and other ads are going up in price, businesses have learned to take advantage of all the traffic that goes by their stores everyday. By advertising on a banner and putting it up at their location, they take advantage of the thousands of vehicles and people that pass by their location everyday. The larger the banner, the easier it is to see. By changing out the Clark County outdoor banners every so often and rotating them with new advertising, they get to market to a wide variety of customers. C;ark County outdoor banners can be found at any of the sign shops and print shops located in Clark County. A simple check with Clark County business licensing will make sure you found a reputable shop. February 14, 2016 Robert W.
Clark County construction signs are many times required by law to be specific sizes. 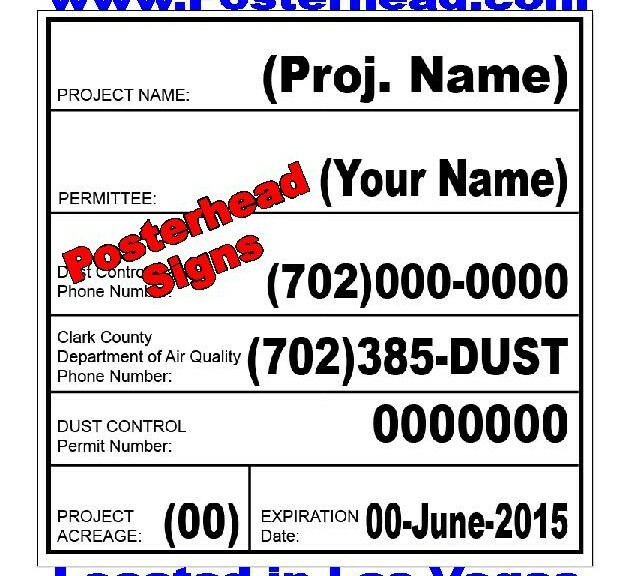 For example, the Clark County dust control sign is 4ft x 4ft for construction projects under 10 acres, yet the dust control signs are mandated to be 4ft x 8ft when construction projects are 10 acres and over. The type on the sign is required to be certain size and other legal requirements. There are many types of Clark County construction signs such as no dumping, no loitering, dust control, vinyl banners etc. The important thing to remember is to be in compliance with the county and stick to their colors and text size to be compliant. Usually these signs are made out of an aluminum substrate so that they last a very long time in the outdoor elements of Clark County. Rain may rust a steel sign or destroy a wood sign, but an aluminum sign will be able to withstand the different seasons of Las Vegas along with the intense sunlight during the summer months. Also, you should use eco solvent or latex inks when printing these signs so that they do not fade in the sunlight as compared to indoor inks. Vinyl banners should be a mesh banner, which allows for air to pass through the banner unless the banner is to be mounted to a solid surface like a wall. Clark County construction signs are not expensive and can be purchased locally at sign shops in the Clark County area to assist you in making your construction project compliant with all government regulations.